pizza | Cooking With Mr. C.
1. In a skillet, put 1 tbsp. olive oil. Cook shrimp and scallops. Sprinkle with sea salt and black pepper. Turn shrimp and scallops while cooking. Should take no more than 5 minutes to cook. Set to the side. 3.Preheat oven to 350 degrees. Brush a little olive oil of focaccia/pizza bread. Place on a baking sheet and place in oven, just for about 5 minutes. You want the bread to begin to get crisp. 5.Return to the oven for about 6-8 minutes. On a large board, put a tbsp. of flour. Spread it out. Roll out pizza dough. It should be about 1/4 inch thick. (Note: It doesn’t have to be round shaped. Whatever works for you.) Brush a drop of olive oil on a baking/pizza pan. Put dough on pan. In a pot of boiling water, put broccoli rabe. Cook for about 3 minutes, or until tender. Drain well. Get all excess water out. Sprinkle a little sea salt and black pepper. 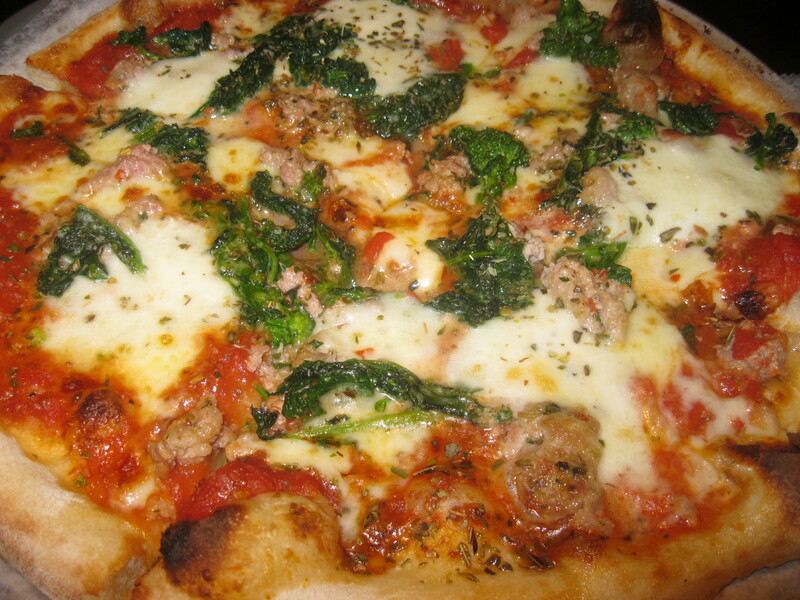 In a preheated oven of 400 degrees, bake pizza for about 20-22 minutes. *It depends on your oven. I checked it very often after the first 15 minutes. You want the dough cooked and crispy, but you don’t want it to burn on the bottom. Remove from oven. Let cool for about 5 minutes. Ladle some sauce on top of bread. Spread it out evenly. Place cooked chicken and shrimp evenly on top. 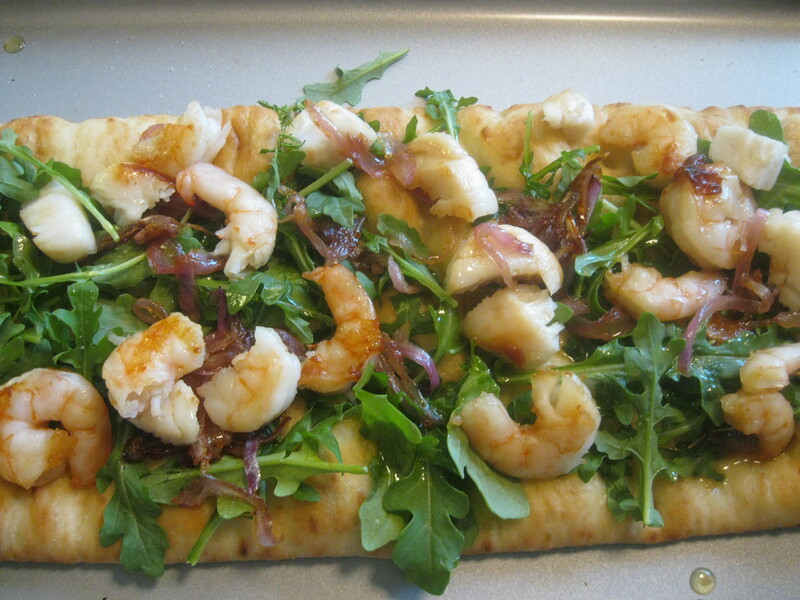 Sprinkle fresh mozzarella on top evenly. Place in oven and bake for about 6-8 minutes. 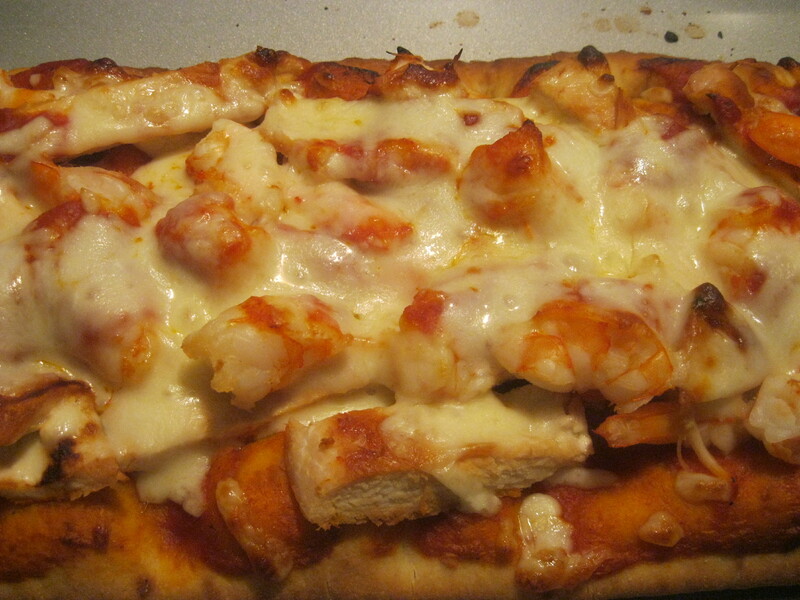 You want chicken and shrimp hot and the mozzarella cheese to be bubbly and melted.